Often, the organization of the tests causes work and costs - information technology enables streamlining and facilitating the organization and implementation of tests. In Mindfindr the results are readily found and easily reached. It is easy to compare test results. Traditionally, organizing psychological assessments has been laborious and time-consuming. But the world has changed. Psychological suitability assessments have moved or are switfly moving to the digital world. The benefits of network services bring along such features as flexibility and ease of use in real-time. They are also very cost-effective. Benefits are particularly emphasized in recurring application appraisals and in processes with a large number of participants. In addition, unpredictable situations, failed tests, etc. may cause problems and unnecessary extra work, often marginally very dear in monetary terms. Advanced network services can substantially improve the organization tests (instructions, communication, analysis, comparison, test result transfer, etc.). The target groups, circumstances and goals of the tests may vary significantly. 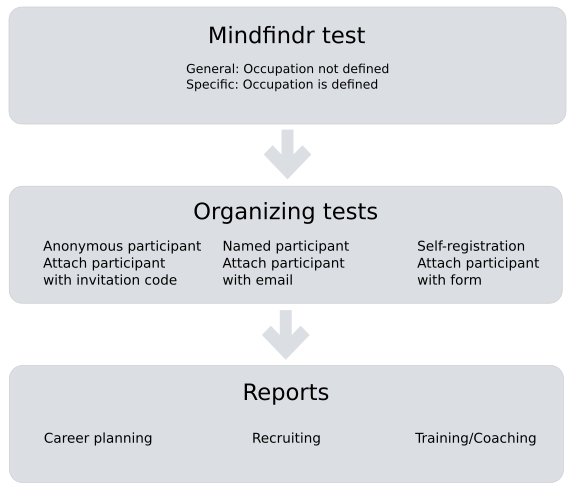 There are several different methods for organizing and implementing suitability assessments in the Mindfindr service. For each test, you can use the desired number of invitation codes for each test. Invitation codes can be sent to the participants free of charge, for example by e-mail or in print. Invitation codes are six-letter codes that allow users to access the test itself. The test organizer can manage the codes as desired. The Mindfindr system does not store the information on the participant individually. The participant is only associated with the code used to take test, and only the test organizer managing invitation codes has specs on the participants. Participants can be directly linked to the test. Through Mindfindr service, users can be sent e-mail invitations. Mindfindr also has a so called "Import" feature that allows the test organizer to import larger groups of users using various potential participant lists. Each test can be associated with a specified registration interface / form. Participants can be directed to a test-specific registration page. The participant accesses the test registration form, completes the name and contact information and then continues to take the test. Participant data and test results are stored in Mindfind. The Mindfindr service has advanced interface solutions that allow assessments to be integrated into various information systems (HR systems, cv banks, etc.) and processes (career planning, recruitment, coaching and staff development).